This week on “Banter with Ben and Lisa,” we catch up on some old TV by touching base on “Downton Abbey” and “Six Feet Under.” Then Lisa and Ben share a few noteworthy celebrity encounter stories before talking about “Blue Jasmine” and “The Conjuring.” Finally, Lisa expresses her love for pretzel buns and Ben sounds off on Justin Timberlake. Come listen! 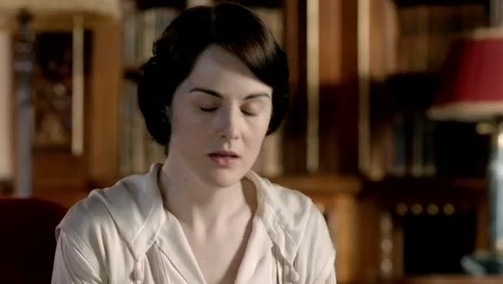 DOWNTON ABBEY PHOTOCAP: Heavens! There’s Been Mismanagement! How much do I love Downton Abbey? Let me count the ways. Or actually, just take my word for it. I love everything about this series — from the dialogue to the acting to the characters to the cinematography. That’s why it’s rather shocking that I only now caught up to the latest episode (heavens!). Due to a time crunch caused by various external events, I’ve been tragically behind on this season, which meant I couldn’t do any photocaps. Thankfully though, I’m all up to speed now, and my photocapping can happily resume. Feels good to be back. Let’s just hope there aren’t any shocking soup scandals to derail me once again. My my! I honestly love Downton Abbey parodies (the best being Downton Arbys). Now comes an entry from Jimmy Fallon. To be honest, I have no idea if this is a brand new skit or something that aired a few months ago. I just found it right now. Honestly, I haven’t even watched it. I just know I want to post it. 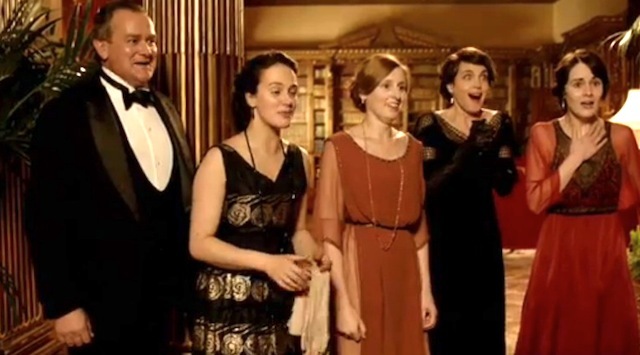 I love me some Downton Abbey, and we’ve seen some spirited parodies over the past few months, including a rather funny, if overlong, video featuring various British comics and Kim Catrall (“Uptown Downstairs Abbey“). To me though, the best of the lot comes from that hallowed epicenter of comedy… Yahoo? Yup, Yahoo! apparently now has some sketch comedy thing it does, and I have to say, if they’re all like this parody — amusingly titled Downton Arby’s — we’re in for some good times. Good actors, good writing, good editing — it’s as if someone found the calling to be USEFUL, as Isobel might say. 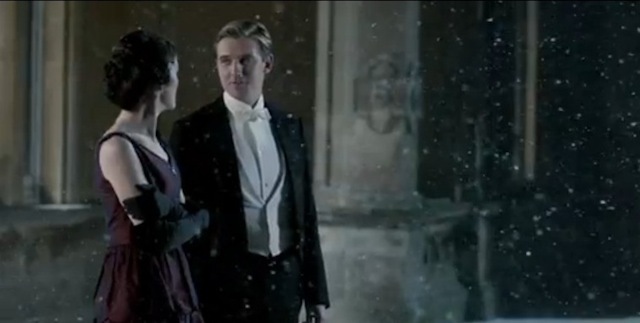 DOWNTON ABBEY PHOTOCAP: All I Want For Christmas Is Downton! Oh my gosh. Downton Abbey has wrapped up its second season, and I’m in official withdrawal. Literally, when the episode ended, I fantasized for a good five minutes about living in a lush, British country home replete with dark green walls, wooden accents, paintings of hunting dogs, and plaid as far as the eye can see. And no, I’m not talking about hipster plaid. I’m talking about dusty, old plaid. And perhaps some tweed. I’m in serious fantasy mode, people, and I’m not sure I can wait until next January for another scant, seven-week season. It will be exciting to see the show move into the twenties, but as the twentieth century marches on, so does the decline of the old guard, and I’m not sure I’m prepared to watch that. Can’t we hop in a time machine and enjoy a prequel season? One that takes place in 1901? That’s a fun time, yes? Full of Edwardian etiquette and fashions! PBS gave us quite the surprise on Sunday. Not one but two crazy hours of Downton Abbey, and they were crazy. The show at times verged on jumping the shark, what with its medical miracles and soapy romantic complications. That’s okay though. It was still highly entertaining, especially thanks to the Dowager Countess who spent much of the first hour doling out her incomparable one-liners. Even the most uneven of episodes will be elevated by her. Things took a few preposterous turns on Downton Abbey this week. A man with a severely burned face claiming to be Patrick Crawley (the former heir who had died on the Titanic) surfaced at the estate, full of tales of amnesia and Canadian exile. No one really believed that this guy was Patrick Crawley, but the perpetually unlucky in love Edith did, despite the fact that this new Patrick had no trace of a British accent (something I naturally assume the real Patrick would have had). For a moment, I thought this charlatan might be accepted by the family, but instead, [SPOILER] they greeted him with suspicion, and ultimately, he fled, leaving Edith heartbroken again. Poor girl. 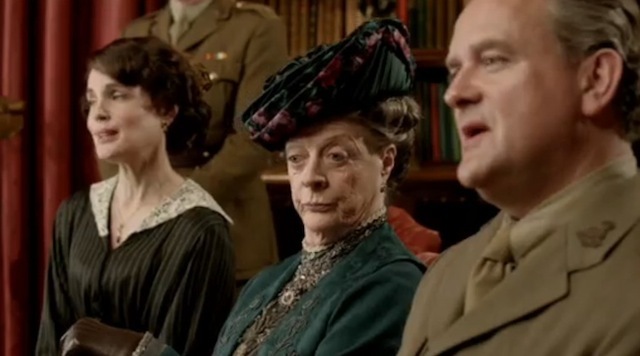 Everyone was crying on last night’s episode of Downton Abbey — even Violet, the Dowager Countess of Grantham! It was an emotional hour full of wrenching twists and turns. Even yours truly got a little misty-eyed at times. Nothing good can come of war, I tell you! Nothing at’all! DOWNTON ABBEY PHOTOCAP: Another Soup Scandal ROCKS The Countryside! 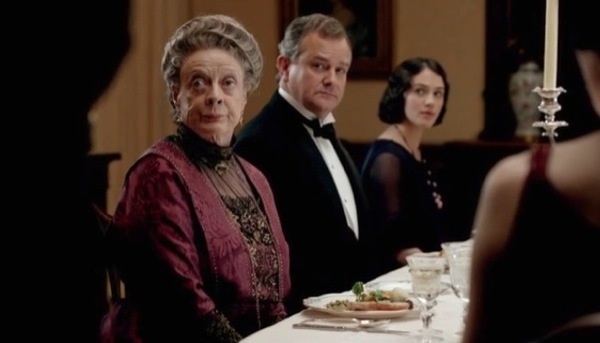 Once again, a soup scandal ROCKED the world of Downton Abbey last night for the fourth time in seven episodes. The first soup incident occurred when Daisy attempted to sabotage Mrs. Burns’ soup by tossing some vile ingredient into the pot. The second such disaster happened when poor Carson nearly keeled over and died during soup service just two weeks ago. The third catastrophy of course was when Branson attempted to serve cow poop instead of soup, delaying the soup service an egregious ten minutes, and the fourth soup incident occurred just last night as Mrs. Burns was discovered to be running a soup kitchen out of Isobel Crawley’s humble home. Scandal indeed!